Following scholarship on gender in science fiction, this book explores the limits of considering age as a social construction, positing that an acknowledgement of aged bodies necessarily changes the way we read both age and science fiction. 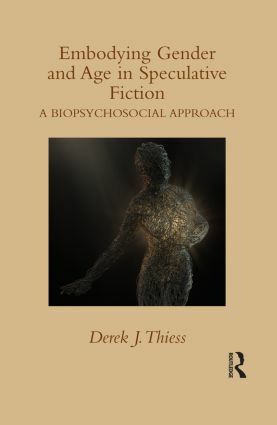 The volume employs contemporary clinical psychology, the biopsychosocial model, to demonstrate that age is an important and neglected topic relevant to the study of speculative fiction. While gender offers a vocabulary, the biopsychosocial approach provides a method to consider age (and gender) as an embodied synthesis of physicality, psychology, and social environment. This respected model of clinical psychology allows a unique and innovative lens through which to read age and the body in literature. Thiess offers readings of established sf classics including Octavia Butler’s Parable series; Orson Scott Card’s Ender’s Game; and cyberpunk authors such as Bruce Sterling, Pat Cadigan, and Neal Stephenson, also exploring more mainstream speculative works including Stephanie Meyer’s Twilight series and Joss Whedon’s Firefly/Serenity. Visiting topics such as care work, sexuality, sport, and the military in these works, the book demonstrates that acknowledging a more fully embodied age is not only necessary for the individual subject, but will also enrich our understanding of other social categories, including gender and race. Taking a constructive—rather than adversarial—stance, this book does not merely question how much one can ethically and responsibly "bend" age, but suggests there is a great deal to learn when one explores those limits. Foreword Arial S. Treankler Introduction 1. Science Fiction and the Abjection of Age 2. Bad Girls (with Older Men): Differently Aged Relationships in the Twilight Series 3. Care Work, Age, and Culture in SF 4. The End of Games: Sport, Anger, and Young Masculinity in SF 5. Age in the Machine: Aged Bodies in Cyberpunk Conclusions: "No power in the 'verse can stop me'"
Derek J. Thiess, Ph.D. is a Tutor at the University of Georgia, USA. He has published in journals such as Femspec and Journal of the Fantastic in the Arts and is also the author of Relativism, Alternate History, and the Forgetful Reader (2014).